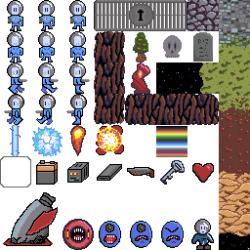 The spritesheet for my latest Ludum Dare entry (includes some sprites I never actually used in the final game). 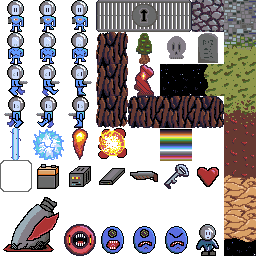 Some fairly decent repeatable terrain tiles with vertical transitions, and some not quite so good player with animation and enemy sprites, as well as a few icons for things like UI and pickups. I'm releasing under CC-BY, but I do not require attribution if you are using this as part of a game, or if you are modifying these for your own purpose.